This is a basic safety training required for Co-Workers at Bridge Storage and ArtSpace who would like to use the Woodshop. THE CLASS IS FOR BRIDGE CO-WORKERS ONLY. If you are not currently a Co-Worker at Bridge, you can join the same day as the training. Click here to schedule a visit! The Woodshop is part of the Co-Working facilities at Bridge Storage and ArtSpace.The 1100 sq ft space contains a full complement of professional woodworking tools and benches, mounted on industrial casters for flexibility. A full dust collection system is in the works. In order to use the woodshop, members need to attend a mandatory 2-hour safety training, which will be scheduled once every 4-6 weeks. 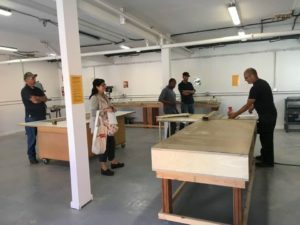 In addition to these trainings, we will be hosting occasional workshops with skilled professional woodworkers for artists and makers who want to learn more advanced woodworking techniques. For more information on our other trainings, please email info@bridgestorage.com. Bridge Storage and ArtSpace is located at 23 Maine Avenue in Richmond. A Bridge Co-Working Membership gives you extended-hours access to our Co-Working Gallery, Art Studio, Meeting Rooms, Woodshop and Sewing Lab. Perks are similar to what you’d find at a more conventional Co-Working space—free coffee, high-speed wifi, color copies, and meeting room usage. To join, visit our front office from 9am to 5pm daily, at 23 Maine Avenue in Richmond. The facilities at Bridge also include a professional film stage and self-storage.